Charles Koch, head of Koch Industries, spoke against "protectionism" at a gathering of political donors last week. Days after the influential Koch political network signaled it would distance itself from President Trump, a major GOP donor is saying "it would be better for them to fall in line." In an interview with Lulu Garcia-Navarro for NPR's Weekend Edition, the donor, Dan Eberhart, CEO of drilling services company Canary LLC, said it was "pretty alarming" that the Koch network was "trying to pick a fight" ahead of this November's midterm elections. "We as Republicans need a united front going into the midterm elections," Eberhart told NPR. 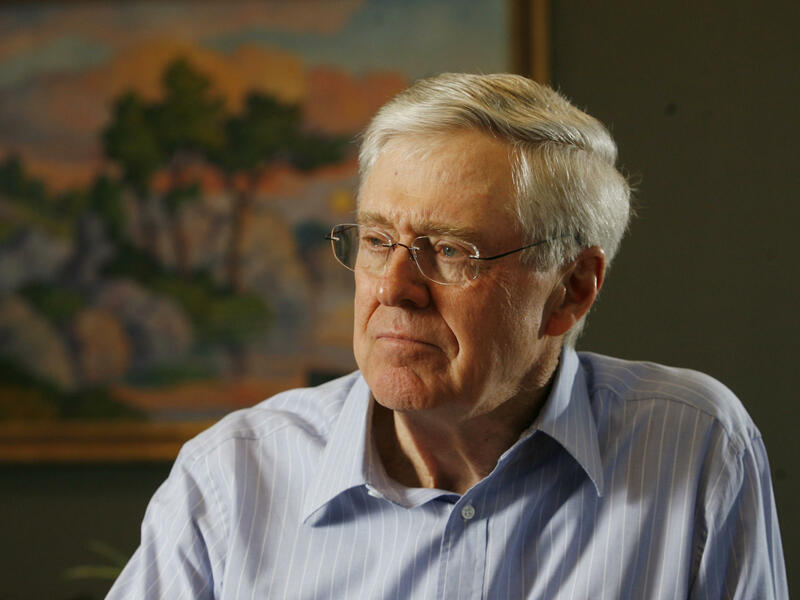 The Koch network was launched in 2003 by the billionaire industrialist Charles Koch. Eberhart is one of hundreds who attended a Koch network retreat in Colorado Springs, Colo., last week, where Koch spoke out against policies on tariffs and immigration supported by President Trump. At the retreat, officials from the network's political arm, Americans for Prosperity, said they are not endorsing Republican Rep. Kevin Cramer in his bid to unseat Democratic Sen. Heidi Heitkamp of North Dakota. "[Cramer is] not leading on the issues where this country needs leadership right now," Tim Phillips, president of Americans for Prosperity, told The Hill. Eberhart, who serves as vice chairman of fundraising for Cramer, told NPR he was "absolutely floored" by the announcement. Asked whether he would be less inclined to donate to the Koch network, Eberhart said, "It definitely gives me pause." "I think that you've got to put the money behind the candidates and the people that are governing to try to affect policy outcomes," Eberhart told NPR. The Koch-affiliated network of donors that met last week has pledged hundreds of millions of dollars to elect Republican candidates in the upcoming midterms. At the gathering in Colorado, Charles Koch opened the summit with a video urging caution against protectionism. "When people act in protectionist ways, they erect barriers, which makes everyone worse off," he says in the video. "The urge to protect ourselves from change has doomed many countries throughout history, and this protectionist mindset has destroyed countless businesses as well." In an on-the-record session with reporters at the retreat, Koch also criticized recent tariffs, saying they would be harmful to the U.S. economy. Trump shot back this week with a series of tweets directed at the Koch brothers, calling their network "highly overrated." The president also called Charles and David Koch "two nice guys with bad ideas." Ultimately, Eberhart told NPR, "if the Koch network wants to maintain its influence in the party, I think that they need to be involved with helping Republicans win elections." There is a growing rift in the Republican Party between money and power. This past week, President Donald Trump attacked the billionaire Republican donors Charles and David Koch, calling them a total joke - that even rhymes - and their powerful political conservative network overrated. For many years, the Kochs have been the biggest game in town for Republicans, pouring millions of dollars into political campaigns and Republican causes. But this cycle, they're threatening to pull back over their differences with the president on issues of trade and immigration. And we should say here that Koch Industries, the company controlled by the brothers, is among NPR's financial supporters. Dan Eberhart is CEO of Canary, LLC, a drilling services company. He's been a major donor to the Koch network. And he joins us on the line. Good morning. GARCIA-NAVARRO: So let's start with one high-profile Senate race, North Dakota. The Koch network announced they would not support the GOP candidate there, Kevin Cramer, in his bid to unseat the Democrat, Heidi Heitkamp, in November. You told the Wall Street Journal that you were floored by this. EBERHART: Yes, I was absolutely floored by it. I think it's very interesting that they've decided to kind of pick and choose which Republicans they're going to back, when I think, at this time, we need a united front going into the midterms. GARCIA-NAVARRO: Yeah, the Koch organization has even indicated it's open to backing Democrats if they share the same goals. Would you ever support that? EBERHART: I wouldn't support that. And I think that's a little bit of window dressing, and they're being a little bit cute with that. I think that, really, they're - what they're really after is a more conservative libertarian streak in holding candidates accountable, you know, under their rubric and their qualifications and their desires. But I don't think that they'll actually back a Democrat. GARCIA-NAVARRO: Are you less inclined now to donate to the Koch network? EBERHART: It definitely gives me pause. I think we, as Republicans, need a united front going into the midterm elections. GARCIA-NAVARRO: You are a supporter of the president. GARCIA-NAVARRO: And so where will you put your money then? EBERHART: Well, look. I think that you've got to put the money behind the candidates and the people that are governing to try to affect policy outcomes. I think the Koch network is focused on policy outcomes, not partisan politics - or at least that's been their stance in the past. But I think we've got to look at, you know, what's on the table as far as the upcoming elections and what can be done to affect policy outcomes in the campaign space. And I think that we need to elect Republicans in the fall. That's how we helped President Trump get his agenda through. GARCIA-NAVARRO: What are other donors saying? I mean, is this a topic of discussion? EBERHART: Oh, I think it's a topic of intense discussion. But I think you've got to look - you know, the Kochs did - you know, they spent about $400 million backing Romney and nothing backing Trump. So I don't think this is as new as the media is portraying it to be. I think they've been cool to Trump for a long time. But I think when you really look at it, what's going on is the Kochs are getting most of what they want. They're getting regulatory rollback. They're getting tax reform. They're getting conservative judicial appointments. They just differ with the president on trade and on immigration. And that's what's causing them consternation. But I think they're actually getting most of what they want policy-wise. GARCIA-NAVARRO: So what are you telling the Koch network? You know, do you think they need to sort of fall in line? EBERHART: I think it would be better for them to fall in line. I think it's pretty alarming for them to start trying to pick a fight 60 days out - or 90 something days out, rather - from the midterm elections. GARCIA-NAVARRO: We just have a few seconds left. But, you know, more traditional Republicans feel the party has been led away from its core values by Trumpism. Republicans have always championed free trade, for example. So what's wrong with a divergence of opinion? EBERHART: Well, I think divergence of opinion is healthy. But I think that, ultimately, if the Koch network wants to be - you know, maintain its influence in the party, I think that they need to be involved with helping Republicans win elections. GARCIA-NAVARRO: Dan Eberhart, CEO of Canary, LLC, thank you so much. [POST-BROADCAST CORRECTION: In the audio of this story, as in a previous Web version, we incorrectly describe Dan Eberhart as a major donor to the Koch network. In fact, Eberhart has not donated to the network.] Transcript provided by NPR, Copyright NPR.